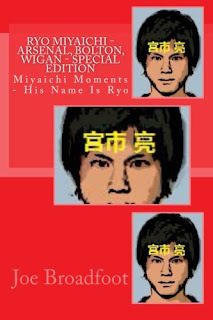 Ryo Miyaichi is such a team-player that he is unlikely to be pleased to hear that a fellow Arsenal winger is injured. Nevertheless, the news that Theo Walcott pulled up in training yesterday, while on England duty, may have some Ryo fans on tenterhooks thinking: will Ryo actually get a chance to play for Arsenal’s first-team in the league? However, I would advise against any optimism that Ryo fans may have of glimpsing their idol in full-bloodied action. Firstly, Theo’s ankle injury he sustained is unlikely to keep him out of action, so the chances of ‘a fit Ryo’ (whatever that is!) stepping in for the first game of the season against Aston Villa are more than remote. Secondly, (surprise, surprise!) Ryo is injured: he is nursing a rib injury, sustained in Arsenal’s pre-season friendly against Nagoya Grampus. The 20-year-old was so desperate to be involved that he hid the injury from the club’s medical staff. While we may laud the youngster’s bravery, some may feel it borders on stupidity if it means an extended period on the sidelines. After the Urawa Reds game, I did say I thought Ryo performed significantly worse than he did against Nagoya. Clearly, we know why now. Ryo was playing through the pain barrier. Post-match, manager Arsene Wenger praised Ryo’s performance, saying it was an improvement on the Nagoya game. As I’ve already mentioned, I completely disagree with that assessment. And now Ryo will be out until around 19th August. Match-fitness is even further away. The only game I’d pencil him in for (albeit with a broken lead) would be the Capital One Cup in late September. I know that sounds cruel, but I think that’s more realistic than expecting Premiership action for Ryo. Anyway, the upshot of him playing through the pain barrier is he will have to endure the pain of disappointment. He’ll probably be on the sidelines again versus Villa: not even on the bench. Although he’s effectively moved up the pecking order since the sale of Gervinho to Roma, he may well have slipped down behind Serge Gnabre, who managed to stay fit throughout the pre-season. It’s really time for Ryo to grasp the nettle . . . but only if he can do so without stinging himself!